Hyperinsulinism refers to an above-normal level of insulin in the blood of a person or animal. Hyperinsulinism can be associated with several types of medical problems, which can be roughly divided into two broad categories: hyperglycemia and hypoglycemia. Hyperglycemia or Hyperglycæmia, or high blood sugar, is a condition in which an excessive amount of glucose circulates in the blood plasma. This is generally a glucose level higher than (200 mg/dl). Hypoglycemia, or low blood sugar is an abnormally-diminished content of glucose in the blood. The principal problems arise from an inadequate supply of glucose to the brain, resulting in impairment of function (neuroglycopenia). hyperinsulinism: Hyperinsulinism refers to an above normal level of insulin in the blood of a person or animal. diabetes: A group of metabolic diseases whereby a person (or other animal) has high blood sugar due to an inability to produce, metabolize, or respond to the hormone insulin. hypoglycemia: A too low level of blood glucose. This refers to an above-normal level of insulin in the blood of a person or animal. Normal insulin secretion and blood levels are closely related to the level of glucose in the blood, so that a given level of insulin can be normal for one blood glucose level but low or high for another. Hyperinsulinism can be associated with several types of medical problems, which can be roughly divided into two broad and largely non-overlapping categories: those tending toward reduced sensitivity to insulin and high blood glucose levels (hyperglycemia), and those tending toward excessive insulin secretion and low glucose levels (hypoglycemia). Also known as hyperglycæmia, or “high blood sugar,” this is a condition in which an excessive amount of glucose circulates in the blood plasma. This is generally a glucose level higher than (200 mg/dl). Reference ranges for blood tests are 11.1 mmol/l, but symptoms may not start to become noticeable until even higher values such as 250–300 mg/dl or 15–20 mmol/l. A subject with a consistent range above 126 mg/dl or 7 mmol/l is generally held to have hyperglycemia. Chronic levels exceeding 7 mmol/l (125 mg/dl) can produce organ damage. It can produce a variety of symptoms and effects but the principal problems arise from an inadequate supply of glucose to the brain, resulting in impairment of function (neuroglycopenia). Effects can range from mild dysphoria to more serious issues such as seizures, unconsciousness, and (rarely) permanent brain damage or death. The most common forms of hypoglycemia occur as a complication of treatment of diabetes mellitus with insulin or oral medications. Hypoglycemia is less common in non-diabetic persons, but can occur at any age. Among the causes are excessive insulin produced in the body (hyperinsulinemia), inborn error of metabolism, medications and poisons, alcohol, hormone deficiencies, prolonged starvation, alterations of metabolism associated with infection, and organ failure. Hypoglycemia is treated by restoring the blood glucose level to normal by the ingestion or administration of dextrose or carbohydrate foods. In more severe circumstances it is treated by injection or infusion of glucagon. Recurrent hypoglycemia may be prevented by reversing or removing the underlying cause, by increasing the frequency of meals, with medications like diazoxide, octreotide, or glucocorticoids, or by surgical removal of much of the pancreas. The level of blood glucose low enough to define hypoglycemia may be different for different people, in different circumstances, and for different purposes, and occasionally has been a matter of controversy. Most healthy adults maintain fasting glucose levels above 4.0 mmol/L (72 mg/dl), and develop symptoms of hypoglycemia when the glucose falls below 4 mmol/L. It can sometimes be difficult to determine whether a person’s symptoms are due to hypoglycemia. Criteria referred to as Whipple’s triad are used to determine a diagnosis of hypoglycemia. 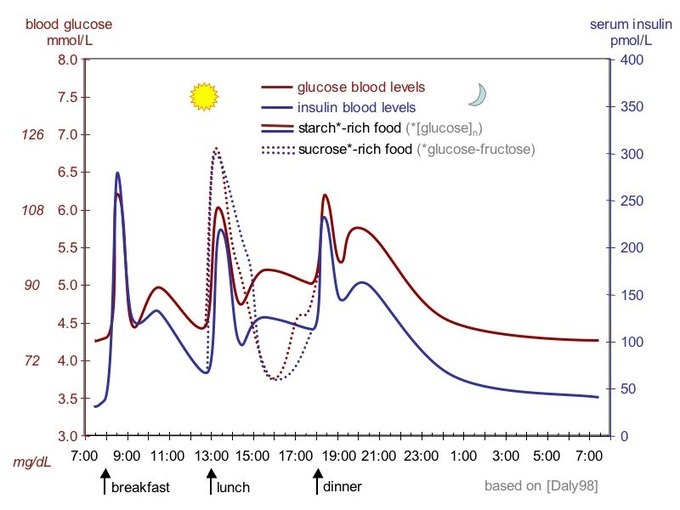 Glucose and Insulin Levels: Insulin rises in healthy adults as glucose intake increases.